The SHOP it UP! Show! "The MAC is proud to introduce the Uptown Trolley Stop Market to our existing array of lectures, events and exhibitions shared with the community at no cost. This open-air market will celebrate the local community and acquaint the Uptown neighborhood with local foods, artisans, and organizations." The gallery is located at the intersection of McKinney Avenue and Bowen St.
Booths are 10 X 10 and cost $30 for one market day and $50 for two market days. For more information, visit their website here or contact their event coordinator at jessica@the-mac.org / 214-953-1212. "Join us for a FREE fun-filled day of entertainment, education and information for the entire family. Activities include: face painting, games, goodies bags, and arts & crafts. Door Prizes will be given away all day. There will be a costume contest at 2pm and Ronald McDonald will be there from 11AM to 12PM taking pictures and signing autographs! It is going to be such an awesome day!" Booths are 10 X 10 and cost $350. Applications are available online here. The event coordinator requests that you note DFW Craft Shows on your application to let the event coordinator know where you came from! For more information, please visit their website or contact Stephanie at sfranco214@gmail.com. In Part I of our Vendor Applications Series, we covered the basic information that your application and promotional items should contain about your event. It is also important to spend some time identifying the type of vendors that you are looking for, the kind of space you are offering, and the general guidelines to applying and being accepted into your event. So, you’ve already talked about what kind of event you are hosting. Now it’s time to discuss what kind of vendors you are looking for. The two biggest and broadest questions here are: “Handmade Only?” and “Juried?” Will you allow consultants (Mary Kay, Pampered Chef, Scentsy, etc.) and if so, will you limited the amount of same-company representatives. If items are handmade, do you require that the maker be the vendor at your show? There is not necessarily a right answer here, I’m just putting the questions in your head. "The 2011 CityArts Festival will take place within Fair Park, a national historic landmark and American treasure that boasts the world’s largest collection of art deco exhibit buildings, art and sculpture. The free, community-based festival will encompass First Avenue along the Lagoon, Cotton Bowl Plaza, Big Tex Circle, Tower Building and Court of Honor. Festivities will be held both indoors and out and will include free admission to Fair Park’s outstanding museums during specific hours." Locations/Dates can vary by weekend. Please double check locations/dates on their website. Booths are 10 X 15 and cost $25. Applications are accepted on their website. This week's giveaway is sponsored by Niloufer of Delight Your Scents. Scentsy began in 2003 with the powerfully simple idea of aromatic candles – decorative warmers with wax melted by the heat of a light bulb instead of a traditional wick and flame. They have since introduced a number of delicious scents and stylish warmers to fit every decor. Check out Delight Your Scents to peruse a sampling of the vast selection Niloufer has to offer. You can also "like" her Facebook Page to stay updated on the latest products, sales, and special discounts. Scentsy plug-in warmers use a low-watt bulb to slowly melt specially formulated Scentsy wax. With no flame, smoke or soot, the Scentsy wickless candle system is a safe way to enjoy more than 80 Scentsy fragrances. The wax melts at a temperature so low, you can dip your finger in the wax and though warm, it does not burn. How to enter: Simply leave a comment (here or on Facebook) and tell us what your favorite childhood scent is. I have many, but I always think lovingly back on the scent of honeysuckle in my Grandmother's front yard, or the smell of my Grandfather baking his homemade peanut butter cookies. Please don't forget to leave an email address, if I cannot contact you then you cannot collect your prize! Contest ends at 10:00PM on Tuesday, May 31st 2011. Winners will be announced Wednesday, June 1st 2011. And the winner is... Gayle of Flamingo Junction! Congrats! 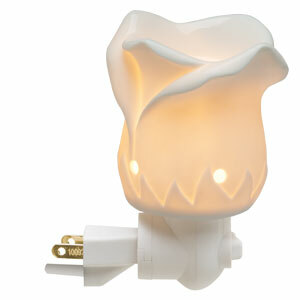 You have won this Tea Rose Scentsy plug-in (featured above) and a scent bar of your choice, a value of $25. This plug-in is great for small rooms, hallways as night lights, bathrooms, and they are safe for your pets and kids. Check out Delight Your Scents to choose from over 80+ scents such as: Welcome Home, Cinnamon Vanilla, Satin Sheets, or Beach! Didn't win? Don't worry--Niloufer hosts more giveaways on her Facebook Page and offers a lovely variety of products for purchase at Delight Your Scents.com! Booths are parking spaces and cost $25 for Vendors and $20 for the General Public. A double space is discounted at $40. Cost will go up after May 25th to $35 per parking space and $60 for two parking space. No electricity available. For more information, contact their event coordinator at bonnirod@yahoo.com or 817-683-8227. "McKinney meets Bavaria with its 4th annual Oktoberfest in Historic Downtown McKinney! This extremely popular festival has expanded to two days and attracts over 15,000 visitors from the area. Visitors enjoy a fun, family-friendly event that offers authentic German music, food and drink, traditional costumes, music, dancing, and children's activities. This year, McKinney Performing Arts Center welcomes an eclectic collection of artisan vendors and crafters to enhance the Oktoberfest experience with MARKTPLATZ at MPAC." Booths are 7w X 5d for $150. These fees include tables, chairs, and electricity. Double booths are not available. Vendors must attend a mandatory pre-event open house to acknowledge booth size and event expectations. For more information, visit their website or contact their event coordinator, Nicolette, at ndaugher@mckinneytexas.org / 972-547-2683. Vendors provide their own display equipment. Booths are free but donations are strongly encouraged. Sponsorships are available for $50 and will include advertisement on the fliers, VIP status for upcoming events, posts from facebook, and website announcements. To apply, please email theagapegems@gmail.com by May 25th, 2011. For more information, please visit their event page or contact their event coordinator, Tiana, at theagapegems@gmail.com or 682-433-2778 / 817-538-9547. "We are putting together a charity fashion show for an organization called Amazing Little Hearts. They support children with Congenital Heart Defects. We are currently looking for 10 to 12 children clothing and accessory vendors that are interested in having their items featured in the fashion show and to set up a booth at the event. Each vendor will have to offer a little something different to feature in the show and therefore will not be in direct competition with another vendor. In fact, this would be a great way to team up with another vendor that compliments your items. For instance, the hair accessory vendors would need to work directly with the clothing vendors to coordinate colors and any other specifics. All the models in the show will be a child or sibling that is directly affected by Congenital Heart Defects." "We anticipate 250-350 guests. MC host will be Natalie Woods, former Dallas Cowboys Cheerleader and current tv host of “Hot On! Homes". Live music, silent auction, food, clown entertainment, and photo set. Vendor fee is $50.00 and all the items featured in the fashion show would be donated to the models. You would have 6 to 8 models (final number is your choice), an 8x8 space to set-up at the event to sell your items (6 ft table provided), you will receive advertising on our event website with a direct link to your own website (website is still in the works, but will be up and running by the 1st of June) and boutique information with fashion show item details in the event program." For more information, contact Crystal at madisonlilybaby@live.com or visit their website to learn more about this charity. "SHOP IT UP! & strengthen families in our community, too! This Side UP! Family FUN Center is teaming up with 50 WONDERFUL area companies to bring you an opportunity to SHOP wonderful vendors, LEARN about Community SERVE opportunities and go home with FAMILY STRENGTHENING tools, too!" Booths are being sold as one 6' table space (bring your own table) for $35. Electricity or additional 2x2’ table is available for $5/each. Spaces are not pre-assigned but will be on a first-come, first serve basis the day of the show. They ask that vendors please consider donating a raffle or silent auction item. To reserve your spot, email sfranco214@gmail.com ASAP! A vendor application is a very important piece of communication between you and potential vendors. First impressions count... big time. Even the simplest application can send a message to your vendors, and we want it to be the right one! If your application is misspelled, sloppy, and missing huge chunks of pertinent information, vendors will wonder how organized you are and what kind of event you will put together. A professional and organized application sends a clear and concise message: whether you've done this a million times or this is your first show, you are putting the time and effort into doing it right. DFW Craft Shows goes through several vendor applications in a single day. My goal is the same as your potential vendors’—gather all the information needed to make an educated decision about your event. Pulling all this experience together, I have constructed a guide to vendor applications. This guide will cover the key information that your application needs to contain, as well as some insight into why your vendors are looking for this information. The guide is broken up into three parts: About Your Event, Vendor Information, and The Template. As you might have guessed, part three will include an easy-to-use template demonstrating everything we have discussed. "Bray Elementary of Cedar Hill hosts an annual carnival, the largest single event of the Bray school year. Proceeds support school functions, including the school’s art program, which is solely supported by the PTA. This year, we are expecting more than 500 children and adults from throughout Southwest Dallas County. Although the carnival is a longtime Bray tradition—with games, live and silent auctions, bounce houses, dunk tank, raffle, pony rides and even a car wash – this year we are opening up the carnival for vendors of arts, crafts and other wares. The event is publicized through local media, the school web site, signs, fliers and word of mouth from students and parents." "Are you ready for some serious shopping? Choose from arts and crafts, children's items, ceramic beaded crosses, kites, hats, purses, potpourri, candles, wind chimes, ceramics, bows and more." "Hot Rods and Heels is a celebration of all things vintage, complete with a hot rod show, workshops, pin-up model showcase, the best vintage vendors in Texas, and of course- our amazing Texas burlesque talent." Admission is $22 (presale) or $27 (at the door). Must be 18 and older.
" Over 600 Shopping Pavilions, perfect for unique gift Ideas for every member of your family - and that all important “You”. Indulge yourself with the very best Dallas has to offer in shopping, fashion, food, entertainment, cosmetics and travel. Spend a relaxing day being pampered with spa treatments, massages and retail therapy." Admission is $10 at the door or $5 online. There is a discount coupon for door admission here. Chairs will be provided at no charge. Applications are available here and are due by June 28th, 2011. For more information, visit their website here or contact their event coordinator, Dandy, at dandrahenderson@tx.rr.com or 972-907-1233. Back Drops will be provided for this show. For more information, visit their website or contact their event coordinator at vendorinfo@shoppingseasons.com. "It's an event you won't want to miss!" "The HomeGrown Music & Art Festival is an annual celebration of just that - HomeGrown music, HomeGrown art and, most importantly, HomeGrown fun." "The Annual Spring Carnival is celebrating its second year and will have a bounce house, games, face painting, raffle drawing, silent auction, vendors, crafts, food, and tons of fun!" "Arts Goggle is a grassroots neighborhood art & music festival, held in the spring and fall. Near Southside businesses are transformed into art galleries and music venues for a Saturday evening, and are stocked full of local and regional artists and performers. Linked by trolley circulators, bike lanes, and our walkable streets, Arts Goggle is enjoyed by thousands each year and is one of Fort Worth's signature cultural events. Don't miss it!" If there is one thing we are probably all familiar with, it's the craft bug. Once it bites, you don't stand a chance. You'll spend hours digging through your stash, glancing between your sewing machine and your knitting needles, eager to get started but overwhelmed with options. Once you are OFF, there will be no stopping you. One project after another... the thirst cannot be quenched! And, of course, when you are part of a community full of artists & crafters, you get to reap the benefits of these ever-changing, always improving, unbelievable selections of amazing new products! This week's giveaway is sponsored by Kristi of Only Prettier. Kristi offers a variety of stylish, handmade products from home decor to jewelery, hair accessories, and every stop in between. Her goal is to make your day a little prettier, whether you are young or just young at heart, her gorgeous products are the perfect way to accessorize! How to enter: Simply leave a comment (here or on Facebook) and tell us about one of your recent artsy/crafty adventures. Maybe it's something you've made, or something you've been thinking about making... I would love to know what you crafty wombats are up to! Please don't forget to leave an email address, if I cannot contact you then you cannot collect your prize! Contest ends at 10:00PM on Tuesday, May 17th. Winners will be announced the morning of Wednesday, May 18th, 2011. International entries are not being accepted at this time. And the winner is... Amy (shoe_queen69)! Congrats! You have won a $25 gift certificate to use at Only Prettier. Visit her Facebook Page or website to view her current inventory, but be prepared to make some tough decisions-- Only Prettier is NOT lacking in their gorgeous selection. Didn't win? Never fear! Kristi has tons of stylish designs available on her website AND she takes custom orders as well! "Like" her Facebook Page and you will be the first to hear about new products and sales! "We're inviting our neighbors to shop, eat, and drink locally. So, join us at Lakewood Village Shopping Center (Gaston & Abrams) and enjoy live music, local food, and area artists from noon to 8:00 p.m. There will be kid and teen activities, and lots of fun surprises. Admission is free, so come explore your neighborhood with us. Featuring music on three stages!" They have 4 booths available for Artists & Crafters. Their application can be found here and are due asap. "Mayfest festival is held annually in Fort Worth, Texas in beautiful Trinity Park along the banks of the Trinity River." "FUN FUN FUN!!! This is our first ever SPRING CARNIVAL!!" "Mother’s and Father’s will soon have their days and teacher’s will be appreciated. Don’t worry! We have 40 vendors selling unique gifts sure to delight all ages and all budgets! Come in and stock up on great gifts for all your favorite people!!" Their flyer and coupons can be found by clicking the event name above. "Vickery Elementary School's 8th Annual Carnival and Craft Fair. The craft fair will be inside the school, in the hallways. There will be a fire truck for the children, and games, face painters, balloon artists, bounce houses, hair color station, auction of baskets, concession food and Kona Ice truck with snow cones and ice creams!" "Cottonwood Art Festival is a bi-annual event which features works from the nation's top visual artists. Located in scenic Cottonwood Park in Richardson, Texas, this prestigious art show has been a part of Richardson life for over forty years." 1321 West Belt Line Rd. THIS EVENT HAS BEEN POSTPONED UNTIL NEXT WEEKEND. "The Forney Fit Fest Committee would like to welcome you to participate in the newest city-wide festival, “Forney Fit Fest,” which includes the 3rd annual Main Street 5K. The mission of the city is to work together to build a sense of community in a safe environment, while attracting quality growth in a family-oriented atmosphere. In Forney we are supporting this mission by gearing up to promote healthy living, and it starts with you!" "Come for the day or come for the week-end to beautiful Lake Granbury and enjoy shopping at our lake side Conference Center and then continue your shopping pleasure in Granbury’s Historical Town Square. This upscale Market Place hosts vendors from all over Texas offering unique and creative treasure to delight you. This is not just an event, it is a shopping experience the same weekend as the famous Granbury Candlelight Tour of Homes. Enjoy the tours and get your Christmas Shopping done all at once!" Applications are available here and are due by October 7th, 2011. Applications received before May 27th will receive a $10 discount. For more information, check out their Vendor Letter or contact their event coordinator at hhsptsa@hotmail.com.